Games in the Tales series tend to follow a predictable pattern. There is always a hero, a heroine, a party of unique supporting characters, and a world-spanning adventure. But Tales of Zestiria breaks this pattern in a big way. Meet Alisha. She is the first female character—and third character overall—you are introduced to in the game. A few minutes in, the hero, Sorey, and his friend Mikleo come across the young female knight unconscious in the ruins they are exploring. They take Alisha back to their village, allow her to rest and recover, and then give her supplies for her trip back home. But when Sorey and Mikleo discover that a human-eating monster is hunting Alisha, they leave their village to warn her. Soon the three are caught up in a grand adventure to save the world. Alisha is a great character. Noble, kind, and proper, she is the princess of a kingdom where the royal family has little to no actual power. Looking for a goal in life outside of being royalty, she became a knight to help those in her kingdom in an active way. But as the world becomes a more and more dangerous place and war looms, she searches for “The Shepherd,” a mythical warrior said to appear when the world is on the edge of chaos. Of course, Sorey is the one destined to become this person. And when he does, she becomes his first disciple, swearing herself to his cause. From the start, it seems clear that Alisha is the main heroine character. She joins your party almost immediately, plays a key role in both the main plot and gameplay, and seems like a natural romantic match for Sorey. But suddenly, around 15 hours into the game, she leaves the party—and other than for a brief 30 minutes in the final few hours of the game—never returns. In her place, another female character, Rose, is introduced. Rose is likewise an interesting character with a complex backstory. Once a soldier and now an assassin, Rose has the potential to become a Shepherd like Sorey. She, like Alisha, is impressed by Sorey and his ability to believe unwaveringly in the best in people and becomes his disciple. Believing herself to already be tainted, she takes it upon herself to do what must be done to ensure their victory—i.e., killing—so that Sorey can remain pure. Yet, while she tries to cover it up with a playful and friendly facade, the act still causes her great emotional pain. It’s a great touch that really makes you feel for her. While Rose and Alisha do share the same slot in the party, they are far from interchangeable personality-wise. Nowhere is this better shown than in the game's epilogue DLC Alisha After Episode: What is Reflected in the Eyes. It follows both Alisha and Rose as they somewhat reluctantly team up and, with the rest of Zestiria's female cast, go on a sort of all-girl road-trip adventure. What's great is that Alisha and Rose do not tend to get along (at first). They fight and bicker as their personalities—one of a noble princess and the other a hardened assassin—clash. Unfortunately, Tales of Zestiria's dual heroine situation has caused a bit of an uproar among Japanese fans. Many were shocked at Alisha's sudden removal from the party and accuse the game's promotional materials of lying to them by showing Alisha as the heroine. Others simply feel that Rose is a poor replacement for the superior Alisha. 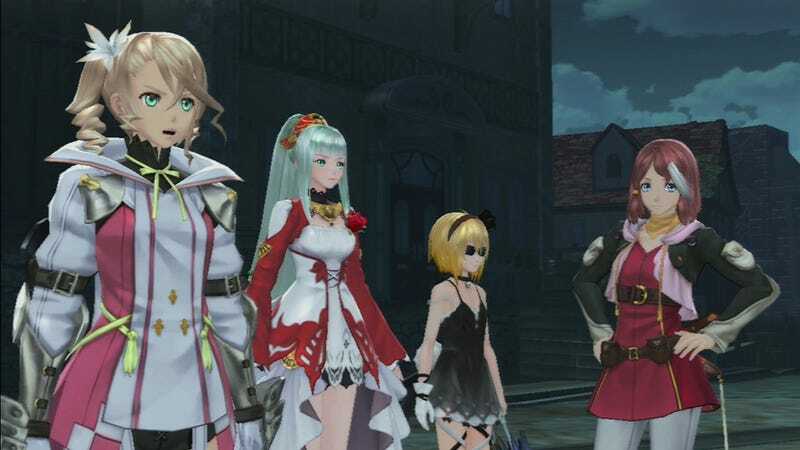 Producer Hideo Baba has gone on record saying that Tales of Zestiria does not have a specific heroine and that players are free to choose their own. Upon finishing the game, my personal verdict is this: Both Rose and Alisha are solid heroine characters—each more complex in their own rights than many previous heroines in the Tales franchise. Regardless, the inclusion of two heroines is a gamble and a clear break from the formula of the series. Now the only question that remains is if this gamble will pay off in the West or if it will polarize Western audiences as much as it did Japanese ones when Tales of Zestiria is released later this year.